A common need and desire of the web interface of Guvnor is to be able to have users of different technical abilities interact with it. Another need is to be able to allocate people different sets of data to "own". These have now been addressed in Guvnor (these features should be available in Milestone 2 and onwards). Typically users identities are managed in a centralised directory - application servers can integrate with these directories (eg active directory, LDAP) so users to guvnor can be authenticated without having to create another duplicate identity. It is also possible (thanks to JAAS) to define what users have the "admin" role for Guvnor (note that an Admin user of Guvnor doesn't have to really be a system administrator). Further to this, guvnor augments this identity with data specific permissions, which are managed in Guvnor itself. There are really 2 system wide roles: Users who are Administrators and users who are not. Easy ! Administrators can see and do anything. Out of the box, the permission system is turned off, and every user is an administrator (this is pretty much how things used to work). There is also a system setting in components.xml that can turn the permissions system on and off (so people can manually override if needs be). 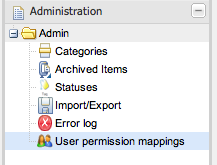 A administrator can also give other users admin rights, regardless of their roles in the external directory service. Package Administrator ("owns" a package - can deploy etc, but has no administrative rights to the system). Package developer - this permissions allows users to create new items, edit etc - but only at the package level (not deploy). They can also run and create tests. Package readonly - well this one is pretty obvious. This is the "interesting" one - as assets (rules) can be tagged with multiple categories, you can use these to assign permissions to an "analyst" type of user. 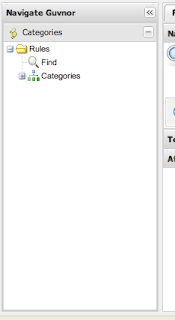 A user can be assigned multiple categories. A user can then edit and view any asset that is tagged in that category (regardless of package). A user that only has category permissions will not be shown any package views or details, and will only see the simple categories view. This allows administrators and managers to control exactly what these users can and can't see. It is the per category "analyse" permission which is quite useful - you can also augment their permissions with a specific package (so on top of their category rights, they can see and play with a particular package - which may be used as a "practice" area, or test area for instance). The above provides a few ways to manage permissions in a coarse or fine grained way, as suits the different types of users.